Andalusia's chalky soil is ideal for the cultivation of the palomino grape, from which the world-famous sherry (jerez) of the region is made. The main sites of sherry production in Andalusia are Jerez de la Frontera and Montilla, and these charming towns are home to plenty of self-proclaimed sherry connoisseurs, who will debate the quality of the sweet amber-coloured blends with the seriousness usually reserved for appraising the finest French wines. An increasingly popular tourist activity for visitors to southern Spain is to tour the bodegas of the region, wineries with a history dating back to Roman times, which specialise in the fermentation of palomino grapes and the production of sherry. Tasting tours of these bodegas are fun and informative, and - especially in the case of Jerez de la Frontera - can be combined with other great cultural attractions, such as checking out a flamenco dance performance, or admiring beautiful Andalusian horses at a dressage event. A bottle of Andalusian sherry makes for a great Spanish souvenir for friends and family back home: visit the bodega of Pedro Domecq and pick up a bottle of their amontillado variety. 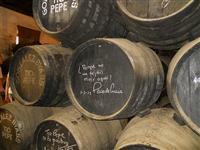 Many tour operators offer day trips to the bodegas but it is also easy to explore without a guide.